A proposal from the Regional Plan Association calls for commercial and residential development along a corridor through the West Side. For more than two years, Mayor Michael R. Bloomberg has insisted that only a football stadium for the Jets could cover the vast railyards on Manhattan's West Side that have long been a barrier to the neighborhood's development. But yesterday the Regional Plan Association, an influential private group, issued a report stating that a residential and commercial development erected on top of platforms over the railyards would generate far more revenue for the city and the state than a stadium, and would promote development on nearby land. 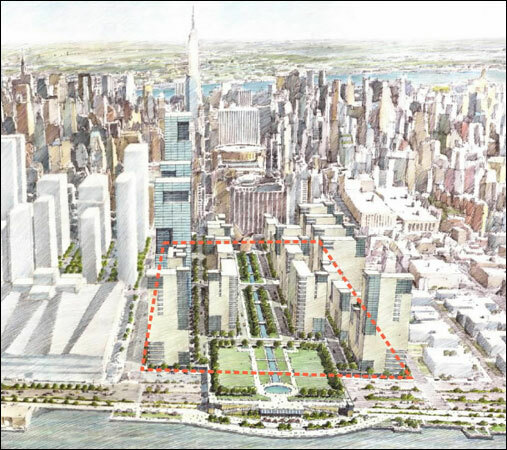 Robert D. Yaro, president of the association, said the group's alternative plan would also provide a physical and visual link between the city and the Hudson River, in contrast to the mayor's plan for a football stadium and an expanded Javits Convention Center that would create a 12-block wall along the riverfront. "From Day 1, the city and the Jets have said that the choice on the West Side is between a stadium and a hole in the ground," said Mr. Yaro, whose organization, financed by civic groups and corporations, opposes building a stadium over the railyards. He said: "We've outlined what we think are very feasible alternatives, involving residential development on the western yard and a mix of residential and commercial on the eastern yard. You can create something more attractive and something that will serve as a catalyst for the redevelopment of the West Side in a way that the stadium will not." The group's alternative comes only weeks before the state is expected to approve the proposed $1.4 billion stadium project for the Jets. The stadium is a key element of the Bloomberg administration's ambitious plan to redevelop the West Side, transforming a 59-block area of parking lots, brick warehouses and factories into a major business district, and it is also the centerpiece of the city's bid for the 2012 Olympics. But the stadium, which would be built on a platform over the railyard between 11th and 12th Avenues, from 30th to 34th Street, has met with strong opposition from local residents, some Broadway theater owners and elected officials from the West Side. These opponents have said they were worried about traffic congestion and feared that the stadium would discourage development. It has yet to be embraced by any major civic group, and both sides anticipate lawsuits. Though the Regional Plan Association's alternative proposal has little likelihood of being carried out, it drew quick reactions in the superheated debate over the future of the West Side. Stadium opponents like the Hell's Kitchen/Hudson Yards Alliance, State Senator Thomas K. Duane and Assemblyman Richard N. Gottfried embraced it. The Hudson Yards Coalition, a pro-stadium group, sharply attacked the plan, saying the stadium "will more than pay for itself - it will generate a profit for New York, and jobs for New Yorkers." Jennifer Falk, a City Hall spokeswoman, said the city would lose millions of dollars in convention and trade show business without a stadium, and would lose any hope of attracting the Olympics. The city and the state plan to invest $600 million for a platform over the railyards and a retractable roof for the stadium, while the Jets plan to put up $800 million to cover the rest of the project. The regional plan group says the city should instead simply build the platforms and then sell development sites to builders. Commercial and residential development would generate net revenues and taxes of $510 million a year, compared with only $74 million from the stadium, the association's report said. Separately, the Steven L. Newman Real Estate Institute at Baruch College has also issued an alternative that addresses the city's waterfront, but shies away from taking a position on the stadium. That proposal calls for building one of the largest convention centers in the world over the railyards, stretching east from 12th Avenue to Ninth Avenue, between 30th and 34th Streets. The institute contends that a stadium and an arena could be built atop the convention center. Like the planning group's proposal, the institute recommends the creation of a commercial corridor extending west along 34th Street from Ninth Avenue to the Hudson River. The existing Jacob K. Javits Convention Center could then be demolished to make way for apartment towers. In creating an east-west orientation, the Baruch proposal opens the waterfront to the city. The Regional Plan Association's proposal calls for building thousands of apartments on a platform west of 11th Avenue and a mix of residential and office towers on a platform east of 11th Avenue. I don't know if this has been posted before..
Looks like those life-less office buildings off the Jersey City shore. I don't like this one either. I do like the extension into the water concept, though. Where's the Circle Line fit into this plan?I also don't see the auto impound yard there,just south of the new ferry terminal.Can't do without these landmark institutions. Now I see the impound pier.But it looks sanitized,no character. Why don't they simply rezone the entire area from 59st-34st, Hudson river to 7th Ave a Extremely High-Density commerical office building zone? I bet you could squeeze out 200-300 million sq feet of office space out of that plan. That's 1 million new jobs. Why not? The Javits can expand and the Stadium could go on some sort of pier, along with a new Cruise ship terminal, Museums, Entertainment, and even Housing (Think Baltimore inner harbor). The area south of 34st to 23st could be a sort of Housing zone with all the displaced residents getting first priority over the new housing. Then sell the rest at market rate. Perfect. Three words: Clinton Special District. 43rd to 56th, 8th to 10th avenue are complete off-limits, a historic district. It kinda crushes the momentum for office space west of Times Square, so a residential high-rise district is growing on 8th instead. Of course, no trains stop west of 8th. Amtrak's Empire Line is well positioned in the area, though (it cuts from underneath Trump Place diagonally to Penn Station)...I wish they could use it for subways. Did you guys read the rest of this thread? A report by the Pratt Institute slams the Bloomberg administration's plans for ensuring that affordable housing is built as the area surrounding the rail yards on the far West Side is redeveloped. The institute claims that the administration's projections that developers will build some 2,600 units of affordable housing are unrealistic, and that it is likely that only about 600 units will be built. The administration estimates that about two-thirds of developers will choose to participate in the so-called 80/20 program. Under that program, developers who build rental units will receive financial incentives if they set aside 20% of the units for low-income families. The institute, however, argues that despite that incentive and other breaks, few developers will choose to build rentals at all, since the condominium market is far more lucrative. The report argues that past rates of participation aren't relevant because more developers nowadays build condos, and that the incentive programs need to be drastically revised. The City Council held hearings last week on plans to redevelop Manhattan's far West Side, and now, after months of being frozen out of the deal by the Bloomberg administration, it is preparing to vote yea or nay. Not on everything - the proposed stadium for the Jets is not in the mix because it would sit on state-owned land. The Council's 51 members will vote on how a 59-block area is to be rezoned, and that should give them enough leverage to ask the city to rethink important questions about financing, density and housing mix. Technically, the Council's power extends only to zoning. But without the necessary commercial and residential building permits, as well as permits required for the proposed extension of the No. 7 subway line, the overall plan, except for the stadium, could not go forward. We oppose the stadium while supporting a larger vision of a vital, mixed-use West Side. Yet aspects of the city's plan need improvement. One is financing. The Council speaker, Gifford Miller, though an advocate of West Side redevelopment, has rightly criticized Mayor Michael Bloomberg's proposal to finance part of the redevelopment through the city's Transitional Finance Authority. This would allow the city to bypass the Council, as well as the capital approval process and the robust public debate that usually accompany expenditures of this size - $4 billion. The Council should also insist that the mayor reduce the plan's density. The plan calls for 26 million square feet of commercial space and some 13,600 apartments. High density is needed if the city is to collect the property tax revenues to finance its plan. But that means buildings along 11th Avenue could rise to 60 stories, walling off the Hudson River waterfront. We don't expect riverfront cabanas, but there should be a way to avoid the overwhelming skyscrapers of the sort that make Sixth Avenue a concrete canyon. The Council might consider a measured phasing in of the development, something recommended by the Regional Plan Association. More affordable housing should also be encouraged. The target area, from West 30th Street to West 42nd Street and as far east as Seventh Avenue, is the last chunk of largely undeveloped real estate in Manhattan and so is a field of dreams for many. The administration's game plan is to use the proposed $1.4 billion stadium to draw new development. It's entirely possible, though, that housing alone could bring new life to the area and alleviate a citywide housing shortage as well. At 3 percent, the city's vacancy rate is well below other large cities. Affordable housing is especially scarce. It's a given that luxury housing will be part of a reborn West Side. The challenge is to maximize units for middle- and lower-income people. Shaun Donovan, the commissioner of Housing Preservation and Development, says the Bloomberg plan would produce as many as 3,100 affordable units. That would be an improvement over an earlier city proposal, but more can be done. Meanwhile, the city could boost the number of affordable units by building on publicly owned land, and the Council could channel tax breaks and improve bonuses to developers who build more than just market-rate housing. The new West Side should be within the reach of all New Yorkers. I like the 60 story high rises! So what if its a 6th avenue like canyon, thats part of what makes NY NY! Ok, so what if north of 42st is off limits? Why not have the current area be entirely office. You still could squeeze the same amount of office space there too. What NYC needs is jobs, and lots of them. This plan will also increase the need for height, which is what you want, correct? The whole "housing" thing can wait, we already have over 8 million people. The Bloomberg administration's $4.1 billion financial plan for transforming the West Side of Manhattan has run into increasing criticism from independent financial analysts as an expensive and risky strategy, which may be impossible to pursue under current statutes. Critics are not opposed to the extension of the No. 7 subway line from Times Square to 34th Street and 11th Avenue, or the new streets, parks and other projects within the plan. But they say that the administration's method of paying for these projects, along with the city's $300 million share in a new football stadium for the Jets, will add an unnecessary $1.3 billion to the price tag and pose risks for the city budget. To provide financing for the project, the administration plans to create the Hudson Yards Infrastructure Corporation, which would issue long-term bonds and short-term debt to pay for the parks, the streets, the subway and a deck over a railyard east of 11th Avenue, between 30th and 33rd Streets, where new development could take place. Using the corporation means the city's financial plan would not have to go through the normal budget process and avoids a potentially nettlesome vote by the City Council. "The city's proposed Hudson Yards financing scheme is fraught with several serious problems and, in my opinion, should be scrapped," James A. Parrott, chief economist for the Fiscal Policy Institute, a labor-backed research group, told council members at a hearing last week. "Instead, a plan of infrastructure improvements for the far West Side should be incorporated into the city's capital budget." Ronnie Lowenstein, director of the city's Independent Budget Office, told council members that the city's proposed plan would cost $1.3 billion more than if the city used conventional borrowing. City officials do not deny the additional cost, but say that the projects, along with a rezoning of the West Side and the proposed 75,000-seat stadium, would catalyze residential and commercial development in the 59-block area, generating more than $60 billion in new tax revenues over the next 30 years. At the same hearing, Deputy Mayor Daniel L. Doctoroff said that in an era of limited resources, the "only alternative is to do nothing." He added, "It's an investment we can't afford not to make." The hearing before the City Council's finance committee did not have the raucous, carnival-like atmosphere of another forum the same week concerning the proposed $1.4 billion stadium over the West Side rail yards, where the chants of protesters collided with the boisterous roar of construction workers demanding jobs. The finance hearing was conducted under the dim lighting of the Council chamber. There were no raised voices and the room began to empty after only 30 minutes. But with the Council expected to vote on rezoning the neighborhood next month, critics painted a dark picture in contrast to the administration's sunny view. Mr. Doctoroff said the advantage of the plan is that it would pay for itself. The corporation, he said - not the city - would be responsible for paying off the bondholders, using tax revenues from new development on the West Side. "We developed a creative financing plan that pays for itself with new revenues it will generate - not with capital budget money," Mr. Doctoroff testified. "That means the Hudson Yards plan won't compete for resources with other important capital projects." In the early years, Mr. Doctoroff and Mark Page, the city's budget director, said that new residential and commercial development would not generate enough revenue to pay the interest on the bonds. So under the city's plan, the corporation would issue about $1 billion in short-term debt backed by the city's Transitional Finance Authority and income tax revenues. But critics say the city would be on the hook for the short-term debt if West Side development does not occur quickly enough and investors fail to buy the corporation's short-term notes. They say the corporation would then be using income tax revenues that flow into the city budget. "You're putting city income tax revenues in jeopardy," said Richard Ravitch, the former chairman of the Metropolitan Transportation Authority and once the state's top economic development official. "But the law is clear that T.F.A. can't be used for projects that don't go through the budgetary process." Earlier in the hearing, Mr. Page insisted that the city was using the finance authority properly, although he acknowledged that the administration had not gotten a legal opinion to that effect. Mr. Ravitch added that the city's financial plan was vulnerable to a legal challenge. And both sides expect opponents of the stadium to file at least two lawsuits in the coming weeks, one challenging the adequacy of the environmental view for the stadium and one challenging the city's financial plan. In an October letter to Mayor Michael R. Bloomberg, William C. Thompson Jr., the city comptroller, also warned that his plan represented a substantial commitment of funds "without the oversight protections inherent in the city's capital budgeting process." Mr. Doctoroff did not dispute the extra cost, but he played down the risk that the finance authority would have to step in, saying, "We don't expect it will ever get called on." As for the long-term bonds issued by the development corporation, the deputy mayor said that bondholders, not the city, would be at risk if the tax revenues from new development failed to materialize and the corporation defaulted on its obligations. But some experts have questioned the city's estimate that 26 million square feet of office space and nearly 14,000 apartments would be built on the West Side over the next 30 years. While the city's demand for housing appears insatiable, economists like Rae Rosen at the Federal Reserve Bank, and James Diffley, a managing director of Global Insight, one of the nation's largest economic forecasting companies, say that the Bloomberg administration is being overly optimistic when it comes to office buildings. "What's implausible is that one new, unproven district would capture all that demand," said another economic forecaster, Hugh Kelly of Real Estate Economics. Critics say that raises the possibility of a default by the development corporation. Although the corporation would be a legally separate entity from the city, State Comptroller Alan G. Hevesi warned in a July report that the bonds "may be perceived by the financial community as a moral obligation of the City of New York and could adversely affect the city's credit rating." Mr. Hevesi noted that the extension of the No. 7 subway line accounted for half the debt. He said major transportation projects have a history of large cost overruns and delays. "I know the bonds can't be sold just on the credit of the Hudson Yards Infrastructure Corporation," Mr. Ravitch said at the hearing. "Mr. Doctoroff may be sincere in saying that the city is not on the hook. But to suggest that a default wouldn't affect the credit of the city is silly."